It’s easy to get caught up in the blame-game. It’s easy to focus on what our partner does wrong, the things that frustrate us, the things that make us angry. But if we all spent a little time and energy focusing on what our partner does right, what makes us feel good and loved, we’d all be a lot happier. This checklist for healthy families is designed to help couples and families work on the positive aspects of their relationships so that the good will so outweigh the bad that the bad won’t even be noticeable. Print this list and tape it to your bathroom mirror, or your closet door, or your dashboard – somewhere you will see it and read it on a daily basis. Make it a priority to try and work on one item a day. If you do, you will be surprised at the difference you will see in your day to day life. 1. Work on positives; eliminate negatives. Successful adults are people who grew up in homes that kept positive focus. 2. “Act as if…” Decide that your day will be a good one and act accordingly. Act as if you want to get out of bed. Act as if things will go well. This exercise sometimes brings astounding results. 3. Live in the NOW. Focusing on the past or future is an unhealthy practice. Successful families live in the present. 4. Learn to process anger. When the feeling comes, say, “I feel furious! What you have done enrages me!” This is much more effective than calling the offender names, and it still allows for the release of powerful emotions that must be expressed. 5. Make a list of at least eighteen things that especially please you. Spouses who make and share such lists with each other often find real surprises – and find new ways to enjoy each other. 6. Know where you are going. 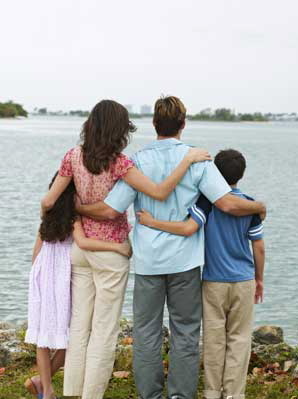 Families need to meet and talk together to establish agreed-upon goals for themselves. 7. Take the initiative. Make plans for the family. Think of things to do and places to go. 8. Practice good communication. Make plans as a family. Share the planning activities regularly. Sit down for full-fledged conversations. Practice writing out things you want to say to each other. Remember that listening is nine-tenths of good communication. 9. Avoid accusation, blaming, and name-calling. The hallmark of emotional maturity is the ability to accept responsibility for oneself, eliminating the need for a scapegoat. 10. Don’t be afraid to seek help in formal or informal settings. In my own effort to grow as a person, I have found that professional help from time to time expedites the maturing process. I know I need help: from God, from trusted friends, and from competent therapists.